Spend a relaxing holiday by the Lake Onkivesi! 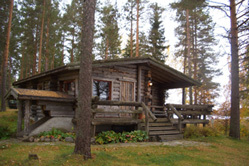 Here in Jokiniemi you stay in a cosy cottage close to nature. 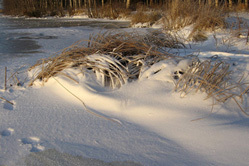 Enjoy a real Finnish sauna next to a lake, easy and fun outdoor activities such rowing and tasty home-made food. Try fishing on Lake Onkivesi or test your skills in tennis or beach volleyball – both courts are available. Nearby sights and attractions are listed on the page Links. 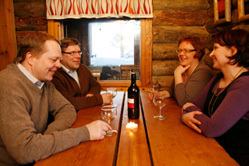 Jokiniemi is a great place for a family celebration, meeting or staff outing. The atmospheric room in the main house accomodates 50 people – summer or winter – and our relaxed Rock ’n’ Roll Barn (summer only) is big enough for 80 partygoers. Just ask us for more details about event options. Welcome to Jokiniemi – our 40-year-old family company is happy to take care of you!